Most of us have been a guest at many weddings, so when it comes to your own, how do you make it unique and memorable? Some couples, like David & Maria Astudillo, know the secret. They knew that if you embrace the places, people and food that mean something to you, something special happens….and everyone can feel it. Maria remembers trying her first lobster mornay as a young girl at The Lagoon, and this early foray into gourmet seafood would not be her last. On meeting the love of her life David, through her brother of all people (don’t worry, they are still great friends to this day), sparks flew, romance blossomed and seafood was shared. “The Lagoon has always been our favourite local restaurant,” Maria said, which meant they were not only familiar with the food at The Lagoon, but also the ideal location. So when David took Maria on a surprise date in Manly (prepare yourself girls)—kayaking together to a secluded beach, where she was greeted by rose petals, champagne, a romantic picnic for two and the man of her dreams down on one knee – in a way, the scene had already been set for what was to come. The Lagoon Seafood Restaurant was where the wedding magic would happen, in the town they had grown up in, in places they had shared together. 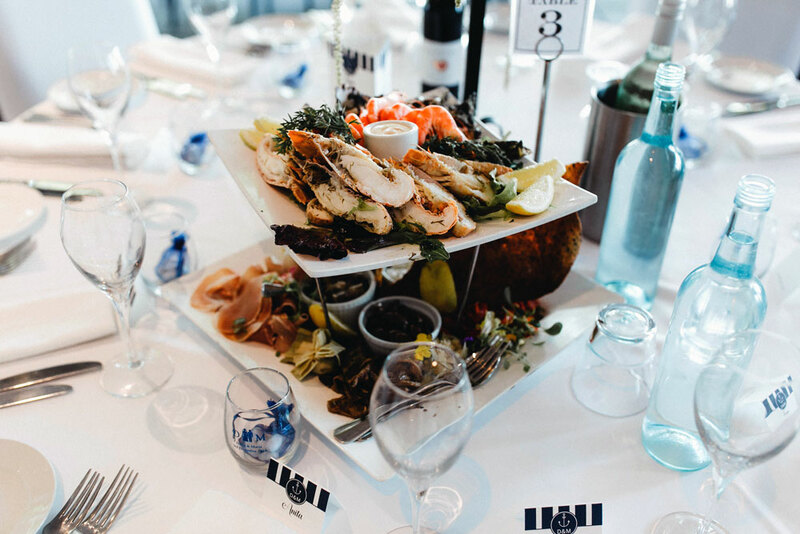 When David and Maria’s guests were greeted with “extremely fresh and tasty” seafood antipasto platters on arrival, there was a great feeling in the air. Fresh seafood served overlooking the ocean, what could be more elegant? “Our entrees, main and desserts were a great success with our guests, who boasted of the delicious food,” Maria said. At the centre of all this, are two loving people with a clear flair for elegance, style and sophistication. In keeping with the theme of embracing that which we cherish on our wedding day, David and Maria chose to bring that flair out through the talents of people they know. It was a beautiful, sunny coastal day in Wollongong, with a string trio playing, the Wollongong Botanic Gardens as the backdrop and friends and family dressed up and smiling. Maria emerged looking stunning in an elegant beaded lace dress over a satin slip from Sposabella Bridal, her flowing hair was pinned with a sparkling hairpiece carefully crafted by her friend and hairdresser Daniela Diaz from Chelsea Hair, and her flawless makeup was thanks to her godmother Angelique. At the reception in The Lagoon’s main dining room, fresh flowers intertwined with vases and candelabras (provided by friend Anita from Pepe’s Garden) were lit up by the fairy lights adorning the ceiling and the soft afternoon light bouncing off the ocean, visible through the glass doors that surround the Lagoon. It was a “magical” scene for David and Maria, and one they will never forget.